You are here: Home / Local Business Internet Marketing / How to Ask for Your Customer’s Email Address… and Actually Get It! How to Ask for Your Customer’s Email Address… and Actually Get It! Here are some pre-crafted tweets you can use. All you have to do is click on the link, and it’ll post to your Twitter account! You may have to log into Twitter first. Hi I’m Carmen Sognonvi. Have you ever tried asking your customer for their email address and they turned you down? In this video, I’m going to share with you exactly how to phrase the question so you can avoid rejection and start building that all-important email list. Email marketing is an such an inexpensive and effective way to stay top of mind with your customers and keep them coming back to buy from you. But if you ask your customer for their email address and they say no, you feel like a jerk, and you’ve lost the opportunity to keep in touch with them. The first thing you have to understand is that you shouldn’t take it personally. People are just so inundated with email these days that they’ve become very protective of their inboxes. The thing is – there is a way not only to get your customer’s email address, but to make them happy and excited to hand it over to you. But before I tell you what it is, let’s start by going over how NOT to ask. Why doesn’t it work when you ask that way? If you ask a yes or no question, you make it way too easy for someone to say no! Plus, you’re not giving them any compelling reason why they should hand over their email address to you. Then what’s the right way to ask? If you want to ask and get a customer’s email address, you have to take a matter-of-fact approach, and just make it part of the process of doing business with you. Here are the 3 things you need to do in order to accomplish that. Give your customer a compelling reason why they should give you their email address. What awesome thing can you give them? I’ll share 4 examples with you in just a minute. Don’t ask permission. Instead, let them know about the awesome thing you’re offering, assume that they want it, and simply ask them to clarify which email address is the best one to use. So those are the principles, but here’s how you would actually phrase it. See how simple that is? The key is to say it with confidence, be matter-of-fact, and don’t seem like you’re begging. Now I’ll break down a few different scenarios for you, and suggest some examples of the awesome thing you could offer your customers. Everyone wants to get the most bang for their buck, which is why this approach works so well. Everyone wants to feel special, and that they’re in the know, so offering exclusivity works really well. If I know I can save money, it gives me a reason to come back to this particular shop instead of the wine store around the corner. Everyone likes free stuff, but if your server is able to say it in such a way that makes it seem like he’s doing a personal favor just for this customer because they’re so awesome, that creates an even greater impact. The secret to getting a customer’s email address is to simply make it part of the process of doing business with you. Keep it matter-of-fact, project confidence when you ask, and you’re likely to get it. Thanks for watching! 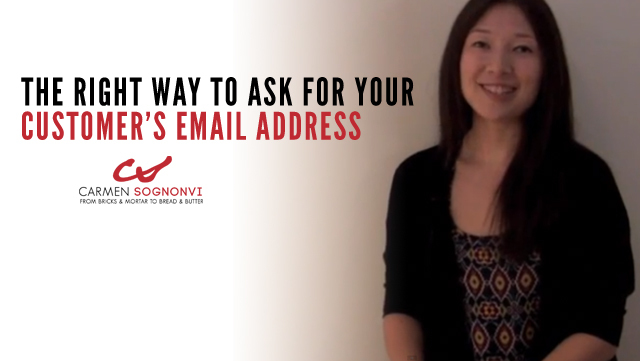 Next time you ask a customer for their email address, try this technique and let me know how it works for you!